Our dog, Dakota, had a birthday on December 31st. She is now two years old. 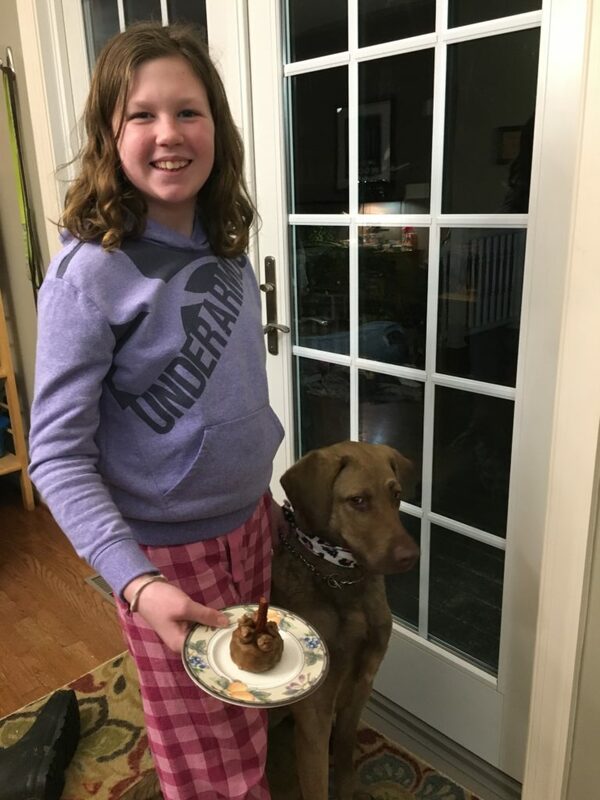 And like any good dog mama, Megan wanted to throw her a birthday party – complete with a doggie birthday cake and party favors. My first thought – this sounds like a messy kitchen that I will have to clean up! After I took a deep breath, I realized that this was a chance for Megan to make a plan and follow through with it. There would likely be road bumps along the way and she would have to persevere in order to make this party a reality. So – I became her cheerleader and follower – what do you need me to do, are there any groceries I can pick up, etc. ? I was very careful to make sure she was still in charge. And sure enough, she pulled it together and we all ended up singing Happy Birthday to the dog on New Year’s Eve! It’s never too early to start developing your child’s ability to think strategically and become a good communicator – even foster their powers of persuasion and influence (although most kids don’t need help with that one). These skills are always in demand by future employers and will serve them well later in life. So, if your kiddo isn’t signing up to be the captain of the soccer team, then give them opportunities at home to practice being a leader – it could be as simple as hosting a dog birthday party! followed a recipe from Rosanna Pansino of Nerdy Nummies for the dog birthday cake but had to modify it since we didn’t have the right size pan. Here is where you can find the original dog birthday cake recipe. I think Dakota had a lot of fun too. You are probably thinking, “Megan, how did you get the frosting to sit so perfectly on the cake?” The trick is that mixing together mashed bananas and peanut butte, it creates icing that is oily and you can mold it like fondant. So you put a ball of icing on top of the cake and you can use your fingers to mold it around the cake. To decorate, I formed little balls of icing and placed them around the top of the cake. My secret to royal icing is to add “too much” powdered sugar. Then you take a toothpick to dab on some icing and spread it around the cookie. That way, the icing won’t spill over the edge. Then you don’t touch the cookie until it hardens. I think Dakota really enjoyed her mini-cakes. She liked them so much that she ate it in one bite. Dakota really enjoys food. To this day, we still haven’t found anything that she won’t eat.